These all using the Fate Freeport Companion rules, and were mostly to see how its conversion rules worked, so they’re pretty much direct translations from Pathfinder to Fate Freeport. I may do some stock Fate Core or FAE versions in the future, who knows. Writhing and pulsing on a dozen legs, its snapping mandibles dripping with venom, this segmented horror is the size of a horse. A mindless eating machine, these giant centipedes scuttle forward in search of prey. They lurk anywhere it is damp and dark: forests, swamps, and especially subterranean caves. Melee Attack: Pincers (+2 Dex); normal damage and if the attack succeeded with style, the target is Poisoned. These are designed as lower-level threats; in most Fate games I’d stat them up as mooks or mobs, but Fate Freeport doesn’t really handle those beyond swarms. They’re not particularly powerful (in Pathfinder they’re a CR 1/2, meaning two of them are an average challenge for a 1st level party), so us numbers over brawn.. The earth cracks open, spitting forth a twisting mass of legs attached to a long, multi-segmented body. Antenna and venom-dripping pincers gesticulate wildly, honing in to find some fleshy morsel consume. Its many long legs propel its gigantic bulk at surprising speed; its hide is thick chitin, and its maw is large enough for it to consume creatures larger than itself. Thankfully, they are found only in the darkest and most remote forests and deep underground. Melee Attack: Pincers (+6 Str), normal damage and the target is Poisoned. 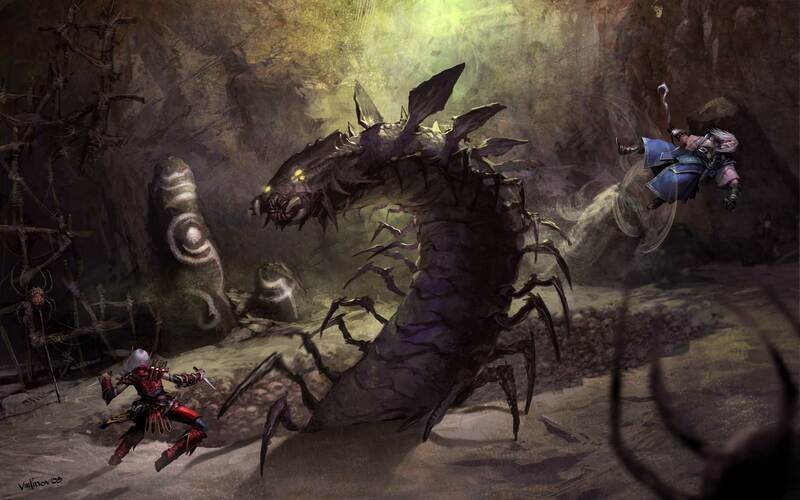 Enormous: A gigantic centipede is so big, it can attack anything in the same zone or an any adjacent zone. One of the established tropes of D&D is to make bigger and bigger versions of the same normal creatures. If the giant version of a normal centipede is the size of a horse, then how big is a stonking great centipede? I don’t think you really want to know. This is more of a challenge for seasoned characters, especially due to its size and massive Strength and Constitution stats. Plus, dat health—it was just shy of another Mild Consequence.